While some people can be somewhat predictable and have a somewhat more methodical way of doing things, others can be completely random. Even if their actions aren’t truly random, it can sometimes appear that way from an outside view. 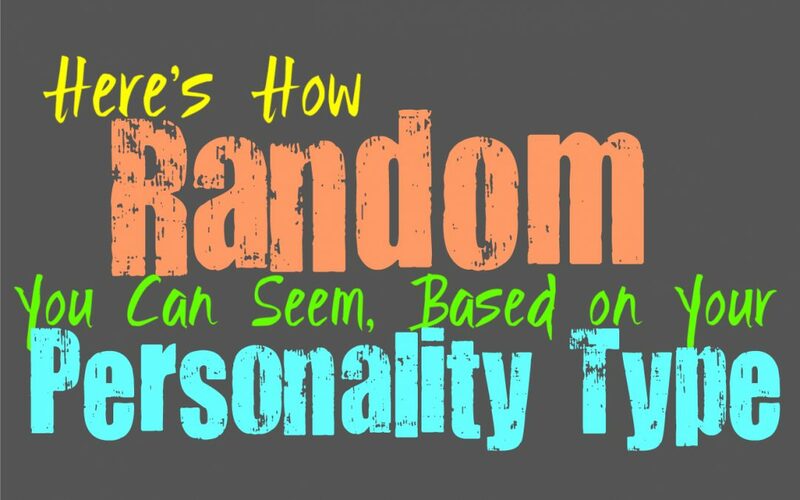 Here is how random you can seem, based on your personality type. INFJs do often have a random side to them, but it isn’t quite as obvious or unintentional as some might think. For the INFJ this randomness is more of a playful quality, which happens when they let out some of their own rich inner world. They have so much going on inside of their minds that it can appear a bit random to people who don’t quite understand. INFJs don’t usually share this side of themselves, so most of the time they appear concise and easy to comprehend. They know how to be direct and focused, but at the same time their active minds are filled with so much that it can seem random to some. ENFJs can have a random sense of humor sometimes, but they try to keep things clear and easy to understand. They can be a bit high energy and when this happens they will be a bit all over the place. ENFJs often have a precise direction in where their thoughts and actions are going, even if it might not seem that way to others. They simply have an intense energy and definitely enjoy connecting with others. ENFJs are very social people who crave being able to make others happy and do their best to provide for them. INFPs can be very random, or at least it appears this way from an outside view. Their thoughts tend to bounce around from one thing to the next rather quickly. INFPs inner minds can be extremely active and often run all over the place, which definitely seems random to others. In truth their minds find all sorts of different patterns, which take them in directions that people can’t quite follow. There is often a pattern and a path that gets them to this seemingly random result, they just don’t often explain every detail or even have the ability to explain it. ENFPs can appear random to those around them, sine their minds bounce around from one thought to the next. They might find themselves jumping to different conversations in what seems like a random way, but in truth their minds have already made so many connections in order to get to this result. ENFPs just don’t find it necessary or useful to explain their entire path, and so they do seem a bit random at times. They can also have a bit random sense of humor, but this is often something people enjoy or find fun to be around. INTJs usually don’t appear all that random, since their actions are rather concise and even a bit methodical. They prefer to do things in a specific manner, and don’t take action unless they have prepared for what will come next. INTJs can hold a conversation without going off on tangents, and enjoy being able to focus on the situation in front of them. They can become annoyed with people who are too random, since they fail to really express themselves in a way that is useful or efficient. ENTJs aren’t usually random people, and can actually be quite the opposite. They can even become a bit annoyed with people who are too random, since they seem too chaotic for their own good. ENTJs prefer to focus on getting things done and work hard to accomplish their goals in life. They don’t allow things to stand in their way, so being too random can cause them to lose focus. ENTJs know how to express themselves in an efficient and direct manner, and they value being able to get their point across. INTPs can actually be a bit random, or at least they appear this way to others. They have such rich inner minds, and their thoughts can often go off in many different directions. While INTPs do have a pattern for how their thoughts drift so far off, this isn’t something that most people can really see or follow. So ultimately they appear random to those around them, especially people who don’t understand just how intense their thoughts can be. INTPs can also have a somewhat random sense of humor, but it can definitely be a hit with people who appreciate it. ENTPs can be seriously random to most people, even though it is much less random than it seems. Their inner minds make so many patterns that it can often seem a bit random to those around them. Their minds have a way to creating these patterns so quickly, and so people around them usually struggle to keep up. ENTPs definitely have a way of being rather random in their delivery, and in the way they bounce from one thing to the next so quickly. ISTJs aren’t usually very random people, since they prefer to be direct and precise. They focus on doing what is important to them, and work hard to make things happen. ISTJs don’t like being random, instead they want to be focused on getting things done as efficiently as possible. For them being random can be a bit stressful, since ISTJs like things to be easily to understand and out in the moment. Someone who bounces all over the place can be difficult to really trust or rely on for anything important. ESTJs aren’t usually random people, instead they believe in focusing on what is important and right in front of them. They are rather efficient people, and value being able to get things done as best they can. ESTJs are very driven people who don’t like allowing anything to get in their way when they are focused on accomplishing a goal. They do have a sometimes random sense of humor, especially around someone who brings this out in them. But when it comes to conversations they don’t want to be random or all over the place and can become overwhelmed by people who are. ISFJs aren’t usually random people, instead they are rather to the point and even methodical. ISFJs don’t really like things that are too random, since it requires them to lose focus on what is important. They do work hard to take care of their loved ones and want to do whatever they can to make them happy. For the ISFJ being random can mean being too chaotic, and with cause them to lose sight of what truly matters. They prefer to remain on task, and get things done as best they possibly can. ESFJs are focused people who want to do whatever they can to provide for their loved ones. For them being too random or all over the place can be a little bit stressful. When they are trying to focus on what things they often need room to do so, without constant distractions or derailments. ESFJs do have a sometimes random sense of humor, and this side of their personality can be brought out by the right company. ESFJs enjoy doing whatever they can to make others happy, and simply want to provide for their loved ones without interference. ISTPs aren’t usually that random, although they do enjoy living in the present moment. ISTPs love seeking out adventure and excitement, and don’t want to feel stagnant for too long. They enjoy being able to jump into something new without feeling held back by anything. Their desire to bounce around can sometimes cause them to appear random, in truth they just want to experience something new and live in the present. ESTPs can appear a bit random, even though they really aren’t, simply because they enjoy jumping from one thing to the next. For the ESTP it is more about living in the present and seeking out things that are fulfilling for them. ESTPs don’t like remaining stagnant and want to be able to jump into something new when they need to. They do seem random when they are distracted by something, in truth they just want to experience something thrilling. ISFPs do have a random side to their personality, since they enjoy experiencing something different. They don’t like remaining stagnant or in the same position for too long, and so they bounce around. ISFPs don’t like feeling bored, and so they might find themselves losing interest and will jump to something different. This can cause them to seem random, especially since they find themselves distracted very easily by something new. ESFPs actually can seem a bit random, especially when they become bored by something. Their minds are constantly bouncing from one thing to the next, since they really hate remaining stagnant. ESFPs enjoy diving into new things and new topics, and can seem a bit random because of it. Their conversation patterns can be a bit chaotic and random, which can be challenging for some people to keep up with at times.